A bit of an ugly and long post today my friends but I'm so thrilled to finally talk about the small side project I've been working on since October. I, well, Dan and I have been renovating a big old leaky smelly house - it's taken all our money, time, energy and sometimes sanity, if you have romantic visions of house renovating then put them somewhere far far to the back of your mind, whilst its throughly rewarding it's also extremely hard-work. It's hard to know where to begin, as I sit here in my living room looking back through the blur of photos so I'll give you a brief out-line and then I'll go into each rooms into detail in future posts. Last year we began the process of house hunting, with quite a small criteria, we had to be near the station for our commute up to London, a garden, a bit of character and a fireplace (that was just me). After a putting in a offer on one house that didn't get accepted and then having a mortgage declined on another due to Japanese knot weed, we decided to cool off our search a little but then this house popped up on Rightmove we just knew it was for us. The rooms where huge, it was in a perfect location and it had a garden, the downside it was quite a project. We put in an offer immediately which thankfully was accepted and then waited for the solicitors to do their thing (which seemed to take an age) finally at the end of September the keys were ours and the fun could begin. If I'm honest we didn't have a clue where to start or what we were doing, slightly blinded by enthusiasm and the smell of old carpets we set about making the house water-tight - adding a damp course and having a leaky flat roof repaired (this was a long and expensive process which I'll go into another time). We had in mind to get our living room and bedroom done first as the kitchen and bathroom needed professionals we managed to get out living room done but that was as far as got. We thought we might have been in at Christmas, not.a. chance, our first lesson learnt, everything takes longer and costs more than you think. By Christmas we had got our plan and finances together and since the first working week of January, we have taken out two kitchens, two bathrooms, knocked down three walls, removed two boilers. Installed one kitchen, one bathroom, one boiler, replaced rotten joists and numerous other jobs. 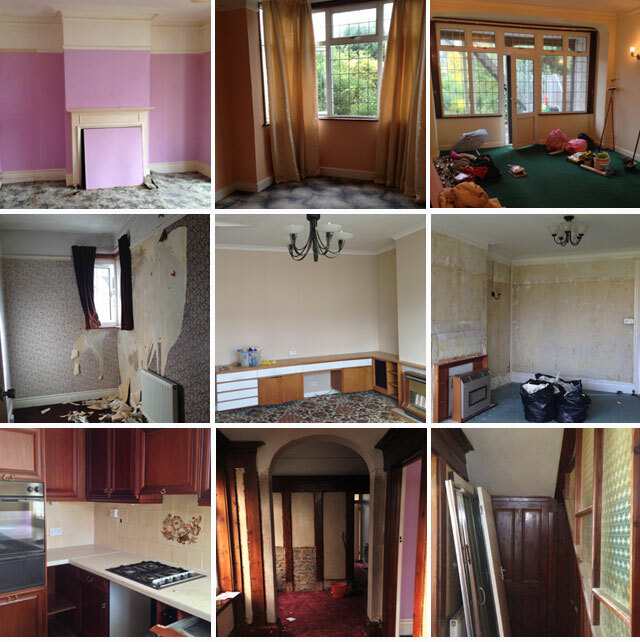 I say we, we had builders to do all the knocking down and building back up and plumbers, electricians etc to do the water and gas related things but we were doing all the clearing, painting and decorating which believe me isn't as easy as it sounds. February and March were particularly hard months, we thought the end was never going to arrive but by some Easter miracle, the house started to feel like a home so we booked a van for the May bank holiday and moved ourselves in. If you're still reading, thanks for sticking with me as I realise these kind of posts are quite self indulgent and probably a bit on the boring side. Now the background has set I can share the DIY's and things I have learnt with you all, can't wait! 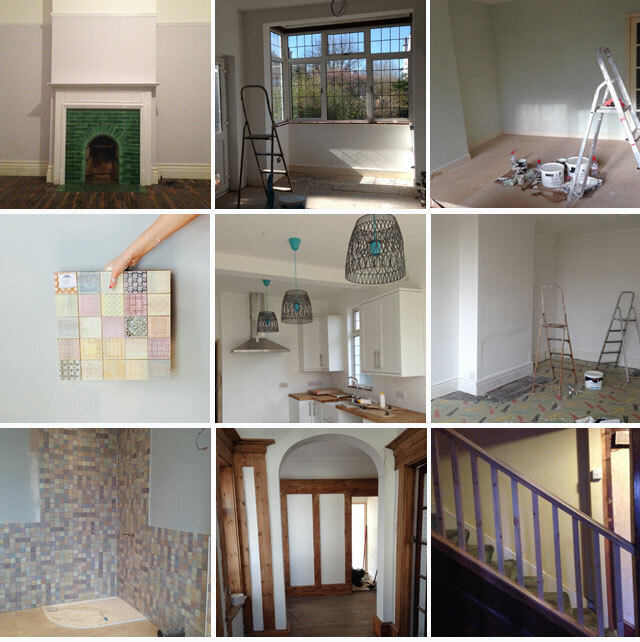 PS - I've tried to keep the photo's of each room the same in each square so you can get an idea of the progress. There are still little bits to finish so I'll do the final rooms soon. I am a massive fan of posts like this - your house looks amazing! I still think that fireplace is the best find anyone doing up a house has ever had - it's so gorgeous! I love your light fittings, too - where are they from? Doing somewhere up can be so, so exciting - really glad to see how beautifully it is all turning out. Ahh thanks Katie. The fireplace is a real gem and I'm so glad that it survived when the previous owners had ripped out all the others. The basket lights are from habitat and I can't remember where the cords are from but I'll find out and let you know. I can't wait to show some more - it has been a massive job but I love it!!! Love this kind of posts... Makes me realise we're not the only ones renovating an old house. It is indeed a lot of work, and everything does cost more time and money than initially thought. I'm just really glad we weren't the only ones to realise way into the renovations. Good luck with any work left!